The beeswax is pesticide and chemical free. Burning natural beeswax candles produces negative ions that are known to draw out impurities improving the quality of the air. Handmade beeswax candles in a terracotta pot with a cotton wick, packaged in a presentation box that includes explanatory text. or light at your altar space. A candle flame represents light reminding you of the shining light of your own being. These handmade candles contain 100% beeswax, cotton wick and a terracotta clay pot. All over India, similar lights are to be found in temples and homes especially during festivals. The beeswax is pesticide and chemical free. Burning natural beeswax candles produce negative ions that are known to draw out impurities improving the quality of the air. The delicious aroma of Indian Chai. 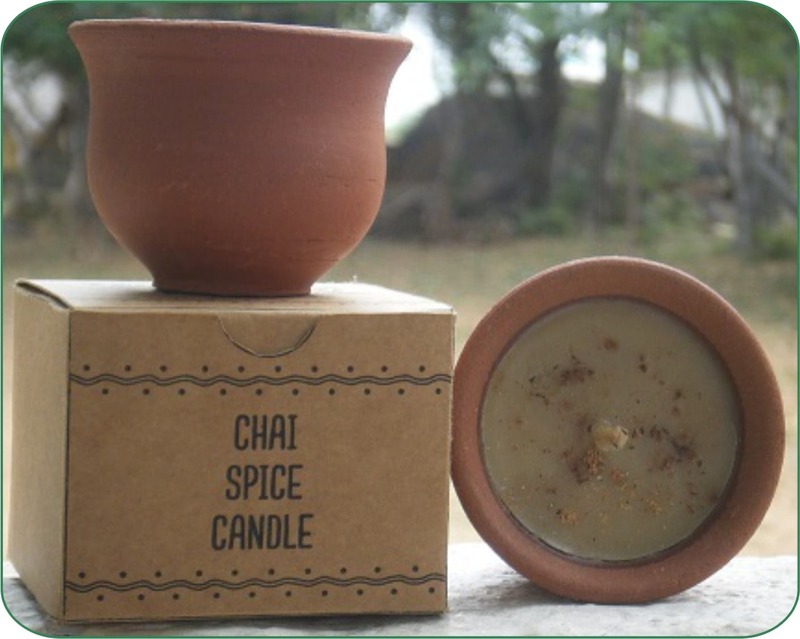 A handmade beeswax candle contained in a traditional chai cup. This candle contains beeswax, coconut oil and 100% essential oils. No synthetic ingredients. Width of each candle (inside edge) 5.5cm and height 5.5cm. 1 x Chai Spice Candle $16.00.